Amesh Wijesekara – the first local fashion star to win the Mercedes-Benz Fashion Talent was selected to show at Berlin Fashion Week where his collection was received by the world’s fashion elite and international media. The critically acclaimed designer was connected to this powerful fashion business platform by Mercedes-Benz Fashion Week Sri Lanka – an AOD-Dimo collaboration that aims to take Lankan talent to new heights in international fashion. 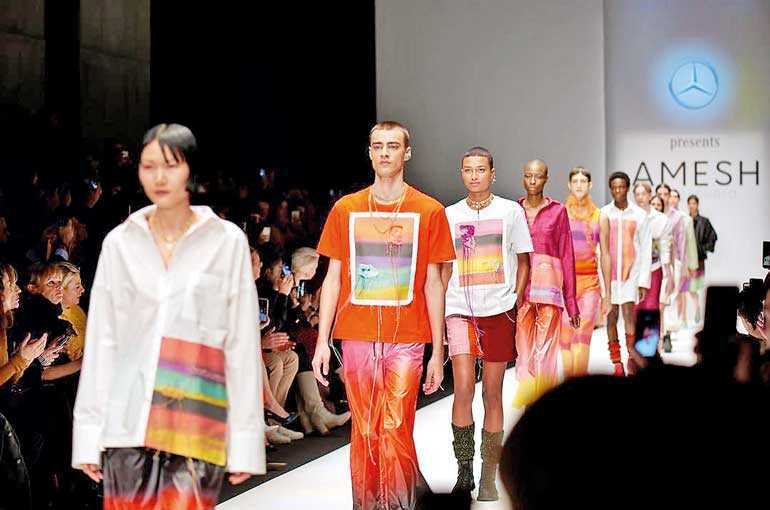 It was clear from the social media feeds of the fashion industry big names, designers and major buyers occupying the front seats of Berlin Fashion Week, that the work of young Sri Lankan designer Amesh Wijesekara left serious impact. The collection that was inspired by Sri Lanka’s sun soaked landscapes and tropical vibrancy communicated an even deeper story of the island’s unusual infrastructures present for the fashion business, bringing together sustainable practices, state-of-the-art apparel manufacturing and rich craft heritages dating back millennia. This unique formula that makes Sri Lanka a perfect destination for fashion brands and designers from around the world, carried a powerful message out to the audience at Berlin Fashion Week. Amesh, who was first discovered on the catwalks of Mercedes-Benz Fashion Runways in Sri Lanka back in 2015, is a product of AOD. Since this first discovery, Amesh went on to win award after award, accolades and recognitions from several fashion authorities and platforms around the world. The Graduate Fashion Week in the UK, London Fashion Week IFS, Fashion Scout UK were some of these, while his work won the attention of fashion icons like Zandra Rhodes and news media from Berlin to Seoul. 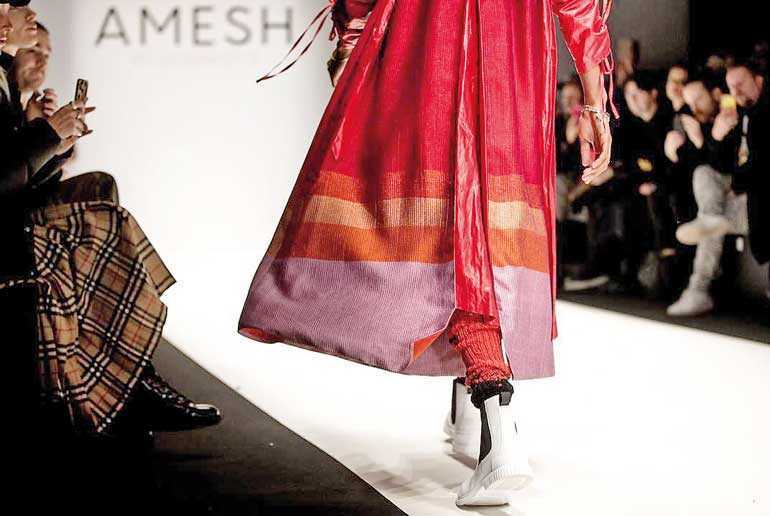 From Sri Lanka’s perspective, Amesh’s success at Berlin Fashion Week adds to a growing network that is being put into place to drive the island’s creative industries. The visionary behind catalysing this creative ecosystem – Linda Speldewinde, founder of both AOD and Mercedes-Benz Fashion Week Sri Lanka – said that Amesh is the beginning of a string of international successes that are being lined up for Sri Lanka. Over the years, AOD has, in fact, taken a regional leadership role in pushing local talent forward to global platforms like GFW, London Fashion Week and Fashion Scout while also creating opportunities at home with platforms like MBFW in Sri Lanka and Sri Lanka Design Festival. Berlin Fashion Week 2019 becomes the newest major platform opened up to local talent through AOD. These powerful global platforms that AOD connects to Sri Lanka are rooted in the recognition that it has received internationally, through the unique fashion philosophy incorporated by the institute; this philosophy where heritage crafts, artisanal communities and the manufacturing supremacy of the Sri Lankan apparel industry are combined with local talent, a world class curriculum and a diverse international faculty, is a key reason why AOD is now recognised as a leading fashion catalyst in South Asia, offering these incredible global opportunities to students in the region. Mercedes-Benz Fashion Week Sri Lanka’s 2019 edition will be held in November this year, and its organisers at AOD and Dimo have already announced their plans to link up more young talent to global platforms through the event. For more information and inquiries, reach AOD on 0115867772 or www.aod.lk.